In this lesson, we will learn how to find the intervals of decreasing and increasing of a function and the concavity of its graph using differentiation. The graph of the first derivative of a continuous function is shown. On what intervals is increasing or decreasing? A is increasing on the intervals and and decreasing on the intervals and . B is increasing on the intervals and and decreasing on the intervals and . C is increasing on the intervals and and decreasing on the intervals and . D is increasing on the intervals and and decreasing on the intervals , , and . E is increasing on the intervals , , and and decreasing on the intervals and . Let . Determine the intervals where this function is increasing and where it is decreasing. A The function is decreasing on and and increasing on . B The function is decreasing on and increasing on and . C The function is decreasing on and increasing on and . D The function is decreasing on and and increasing on . E The function is decreasing on and and increasing on . A is increasing on the intervals , , and and decreasing on the intervals and . C is increasing on the intervals and and decreasing on the intervals , , and . D is increasing on the interval and decreasing on the intervals and . E is increasing on the intervals and and decreasing on the interval . The graph of a function 𝑦 = 𝑓 ( 𝑥 ) is shown. At which point are d d 𝑦 𝑥 and d d 2 2 𝑦 𝑥 both positive? The graph of a function 𝑦 = 𝑓 ( 𝑥 ) is shown. At which point are d d 𝑦 𝑥 and d d 2 2 𝑦 𝑥 both negative? Determine the intervals on which the function 𝑓 ( 𝑥 ) = − 𝑥 − 8 𝑥 2 is increasing and where it is decreasing. Determine the intervals on which is concave up and concave down. A The function is concave up on the interval and concave down on the interval . B The function is concave up on the interval and concave down on the interval . C The function is concave up on the interval and concave down on the interval . D The function is concave up on the interval and concave down on the interval . E The function is concave up on the interval and concave down on the interval . 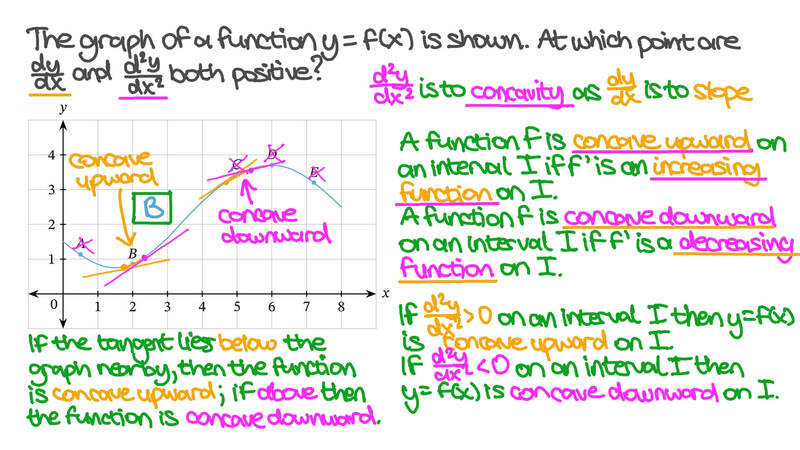 Determine the intervals on which the function is concave up and down. A The function is concave down on and concave up on . B The function is concave down on and concave up on . C The function is concave down on and concave up on . D The function is concave down on and and concave up on . E The function is concave down on and concave up on . Which of the following statements is true for the function 𝑦 = 4 − 6 𝑥 + 3 𝑥 2 ? AThe function is increasing on ] 1 , ∞ [ and decreasing on ] − ∞ , 1 [ . BThe function is decreasing on ] 1 , ∞ [ and increasing on ] − ∞ , 1 [ . CThe function is increasing on ℝ .
DThe function is decreasing on ℝ . Which of the following statements is true for the function ℎ ( 𝑥 ) = − 𝑥 − 2 𝑥 + 1 2 ? A ℎ ( 𝑥 ) is increasing on ] − ∞ , − 1 [ and decreasing on ] − 1 , ∞ [ . B ℎ ( 𝑥 ) is increasing on ] − ∞ , 2 [ and decreasing on ] 2 , ∞ [ . C ℎ ( 𝑥 ) is increasing on ] − 1 , ∞ [ and decreasing on ] − ∞ , − 1 [ . D ℎ ( 𝑥 ) is increasing on ] 1 , ∞ [ and decreasing on ] − ∞ , 1 [ . E ℎ ( 𝑥 ) is increasing on ] − ∞ , 1 [ and decreasing on ] 1 , ∞ [ . Which of the following statements is true for the function 𝑔 ( 𝑥 ) = − 𝑥 − 1 4 𝑥 − 4 7 2 ? A 𝑔 ( 𝑥 ) is increasing on ] − ∞ , − 7 [ and decreasing on ] − 7 , ∞ [ . B 𝑔 ( 𝑥 ) is increasing on ] − ∞ , 2 [ and decreasing on ] 2 , ∞ [ . C 𝑔 ( 𝑥 ) is increasing on ] − 7 , ∞ [ and decreasing on ] − ∞ , − 7 [ . D 𝑔 ( 𝑥 ) is increasing on ] 7 , ∞ [ and decreasing on ] − ∞ , 7 [ . E 𝑔 ( 𝑥 ) is increasing on ] − ∞ , 7 [ and decreasing on ] 7 , ∞ [ .